Donald Lococo Architects preserves history while designing a home for today. 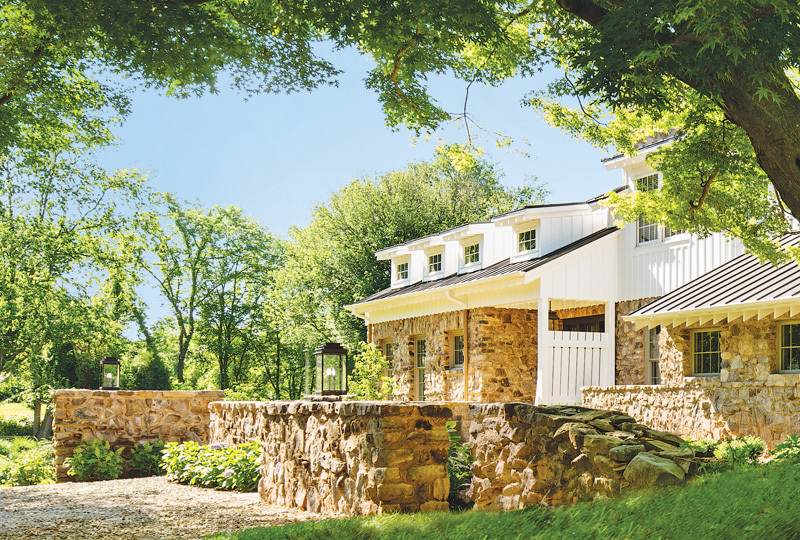 Exteriors of board and batten and fieldstone reflect the home’s historical heart. Architects don’t usually begin a new design by demolishing their clients’ dreams for their property. But when architect Donald Lococo saw the 1920s barn that his clients wanted to raze and replace with a new home, he began a campaign to save the barn and build a nearby home that would make the barn the star of the show. 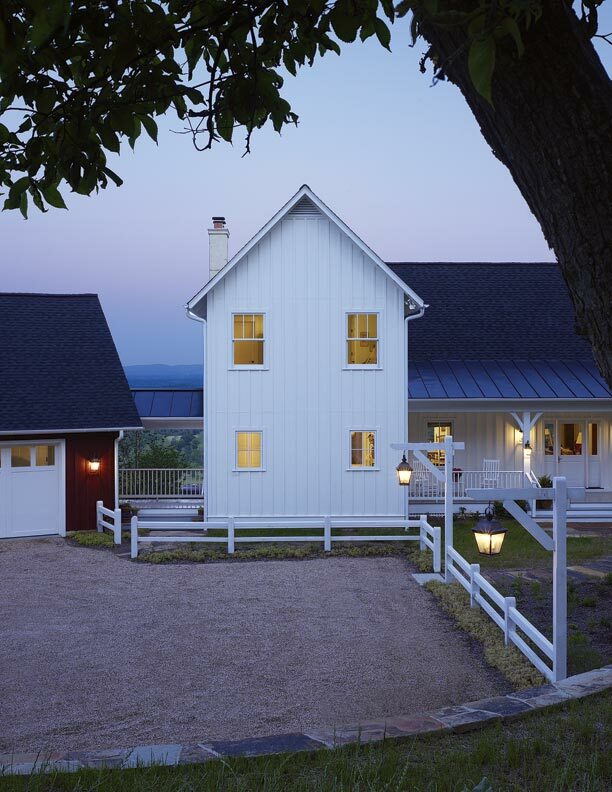 The gracious entryway introduces the home’s interior and the barn, seen through the doorway. 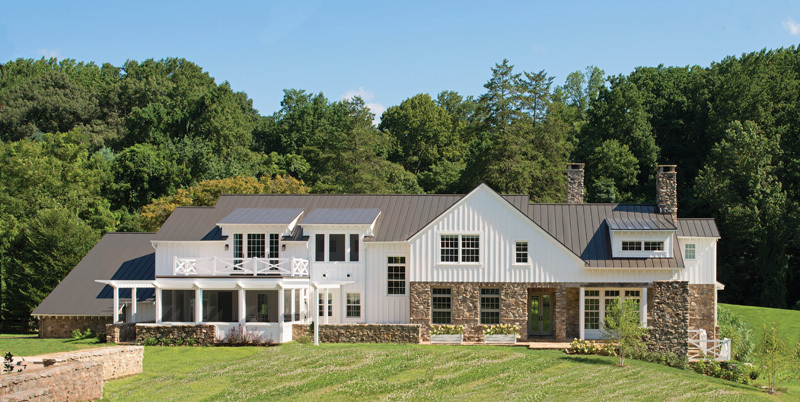 Today, the suburban property in McLean, Virginia, is a visual triumph, with the barn set amid copses of hardwood trees and adjacent to it, a perfectly complementary two-story home in American farmhouse style. 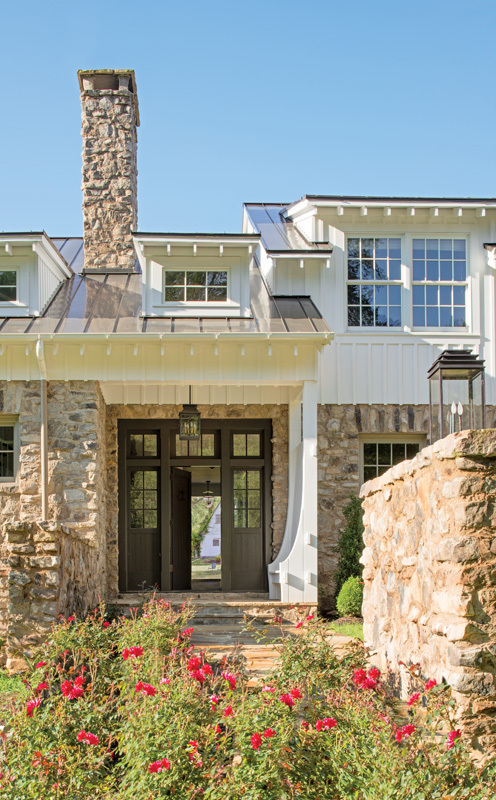 The home’s exterior is a beauty of stone and light, at once shining with early 20th-century farmhouse style and the sparkle of a new home. Set in its lush surroundings, the house—with a granite and batten-board exterior, deep windows, a row of second-story dormers, and a welcoming entry appears to have served families long ago and could easily carry many more into the future. To achieve a design that did justice to both the home and barn, Lococo drew a long, thin plan for the 12,000-square-foot house, with the mass presented in small additive pieces. 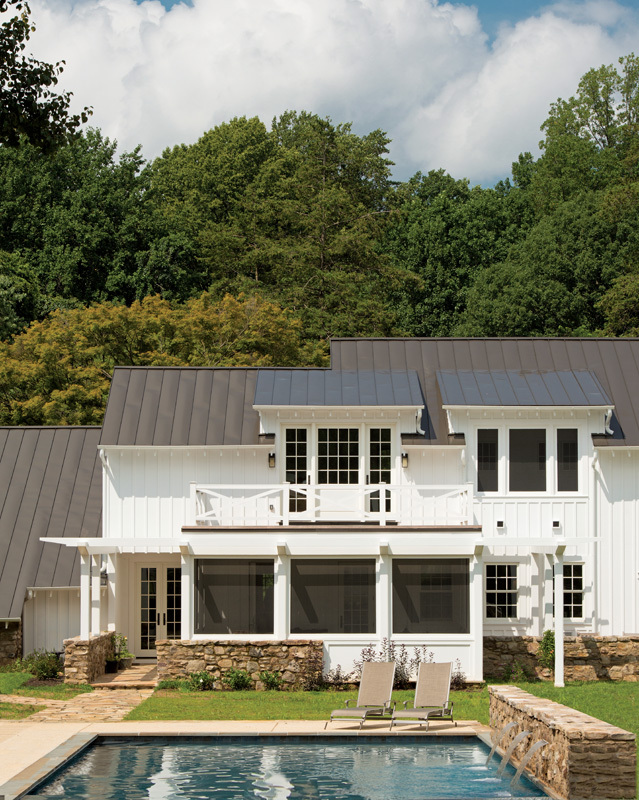 With the help of general contractor Tony Paulos of the Block Builders Group in Bethesda, Maryland, Lococo positioned the new home for beautiful views toward the barn and its backdrop of rolling hills intersected by stone walls. A small cottage nearby was redesigned as a pool house. In the beginning, the homeowners, a couple with grown children, had very different ideas about what they wanted in their new house. She wanted a light, elegant space; he wanted rustic. “Rather than brokering a compromise,” Lococo says—which he figures may have ended with at least one unhappy client—“I layered and intertwined their design wishes.” A clean elegance was achieved with a seemingly open floor plan, windows that separate spaces, and a great deal of light. The use of reclaimed and natural materials fulfilled a mutual desire of the couple’s, as well as the husband’s wish for rusticity. The serene swimming pool is anchored by the same stone used in the home’s foundation. He found slots, holes, markings left by animals and the barn’s long-ago farmhands, and “fantastic truss-work” in the barn’s attic. He also found a shoemaker’s table, complete with old tools, which took on an emotionalism that endeared all the participants in the project. “It became a centerpiece and a symbol of this project,” Lococo says. It is also meaningful to the area, a once-rural swath of land that was dotted with beautiful old barns. This one, Lococo says, is the last one standing. Today, the table stands in the back foyer, a pristine board-and-batten space with chrome and porcelain fixtures. The home’s interior embodies an appealing duality: spare yet elegant, spacious yet cozy. 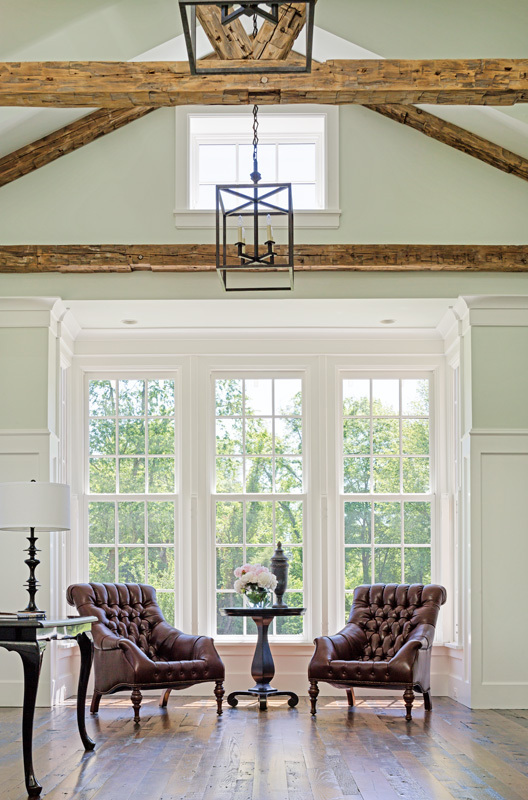 Natural materials, including beams repurposed from barns that bridge ceilings and form floors, look serenely at home. Fieldstone lends an elemental simplicity to fireplaces and detailing. The kitchen floor shines with smooth, rustic slate. A pair of leather chairs sets a tone of intimacy in the main living space. Lococo and the homeowners accomplished the home’s interior design together, creating a warm, homey feel. A dining table from England, and wallpaper and fabric in the family room and kitchen, warm the rooms. “I didn’t want the interior to feel too sterile or stoic,” Lococo says. Mary Grauerholz is an award-winning feature writer and editor with a particular focus on architecture, style, sustainable building, health & wellness, and waterfront life. 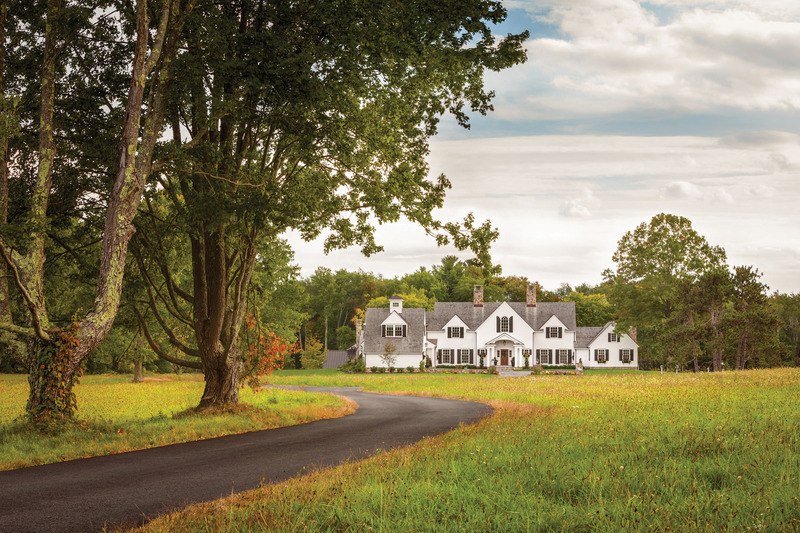 Colonial Revival style defines this classic New England farmhouse by Patrick Ahearn in Massachusetts. A couple from Vermont collaborates with architect Sandra Vitzthum to design a home with a sense of place.